Yesterday felt like Christmas – a snow day in the middle of the week! 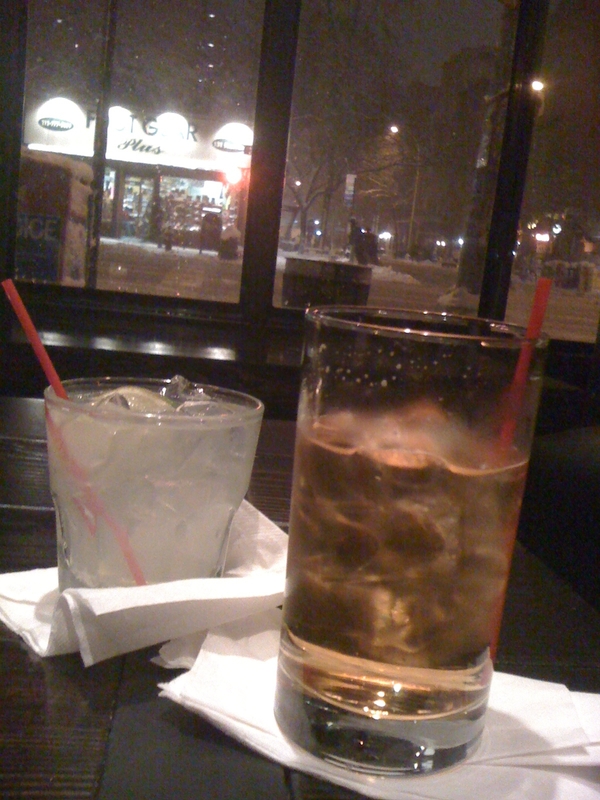 On 1st Ave and 8th St. at the new “V Bar” (in the old Tribe space) we found a cozy spot with great big windows where we could enjoy the snow as well as some cocktails. On the left is “Sicilian Margarita” – tequila, orange liqueur, agave nectar and lime. On the right is “Bitter Lord” – whisky, ginger syrup, bitters, soda and lime. Of course, this sidewalk ended with a deep pool of slush soaking the feet of unlucky pedestrians. Remember, this is NYC. 1965: Gale Sayers sorces 22 touchdowns, setting a record for rookies with a lady’s name.Surpassed by Fetushead in 1998.2005: The ’90s arrive in Green Bay.They still can’t believe they re-elected Grover Cleveland.